Philip Baughman (Philip.Baughman@tylertech.com), Tyler Technologies, Inc.
· Electronic Court Filing Version 5.0. Edited by James Cabral, Gary Graham, and Philip Baughman. Latest version: http://docs.oasis-open.org/legalxml-courtfiling/ecf/v5.0/ecf-v5.0.html. This document defines a Service Interaction Profile, as defined in section 6 of the LegalXML Electronic Court Filing Version 5.0 (ECF 5.0) specification. The Web Services Service Interaction Profile may be used to transmit ECF 5.0 messages between Internet-connected systems. This document was last revised or approved by the OASIS LegalXML Electronic Court Filing TC on the above date. The level of approval is also listed above. Check the “Latest version” location noted above for possible later revisions of this document. Any other numbered Versions and other technical work produced by the Technical Committee (TC) are listed at https://www.oasis-open.org/committees/tc_home.php?wg_abbrev=legalxml-courtfiling#technical. TC members should send comments on this specification to the TC’s email list. Others should send comments to the TC’s public comment list, after subscribing to it by following the instructions at the “Send A Comment” button on the TC’s web page at https://www.oasis-open.org/committees/legalxml-courtfiling/. This specification is provided under the RF on Limited Terms Mode of the OASIS IPR Policy, the mode chosen when the Technical Committee was established. For information on whether any patents have been disclosed that may be essential to implementing this specification, and any offers of patent licensing terms, please refer to the Intellectual Property Rights section of the TC’s web page (https://www.oasis-open.org/committees/legalxml-courtfiling/ipr.php). Note that any machine-readable content (Computer Language Definitions) declared Normative for this Work Product is provided in separate plain text files. In the event of a discrepancy between any such plain text file and display content in the Work Product’s prose narrative document(s), the content in the separate plain text file prevails. Electronic Court Filing Web Services Service Interaction Profile Version 5.0. Edited by James Cabral, Gary Graham, and Philip Baughman. 12 February 2019. OASIS Committee Specification Draft 01 / Public Review Draft 01. https://docs.oasis-open.org/legalxml-courtfiling/ecf-webservices/v5.0/csprd01/ecf-webservices-v5.0-csprd01.html. Latest version: https://docs.oasis-open.org/legalxml-courtfiling/ecf-webservices/v5.0/ecf-webservices-v5.0.html. This document defines a Service Interaction Profile, as called for in section 7 of [ECF 5.0]. The purpose of the Web Services Service Interaction Profile is to provide a web service-based system in conformance with the WS-I Basic Profile 1.1 ([WS-I BP 1.1]) and Basic Security Profile 1.1 ([WS-I BSP 1.1]) for use with the [ECF 5.0] specification. This version adds support for bulk filings. improves security support for tokens, attachments, and rights management through inclusion of WS-Security 1.1 and adds supports for message splitting and assembly through inclusion of WS-Reliable Messaging 1.1 ([WSRM 1.1]). This specification requires an active network connection between the sending and receiving MDEs. · Service interaction profile specifications defining communications infrastructures within which electronic filing transactions can take place. · Document signature profile specifications that define mechanisms for stating or proving that a person signed a particular document. This specification represents an ECF 5.0 service interaction profile based on web-services. It is intended for implementation in conjunction with the ECF 5.0 specification and at least one ECF 5.0 document signature profile specification. Specifically, in this service interaction profile, the implementation details for each of the Major Design Elements (MDEs), operations, and messages defined in the ECF 5.0 specification, are defined in Web Services Description Language (WSDL). · W3C XML Schema 1.0 ([XMLSCHEMA11-1, XMLSCHEMA11-2]). · W3C Namespaces in XML ([XML-NAMES]). · W3C Simple Object Access Protocol (SOAP) 1.1 ([SOAP 1.1]). · W3C Web WSDL 1.1 ([WSDL 1.1]). · W3C X ML-Signature Syntax and Processing ( [XMLDSIG-CORE1]). · W3C SOAP 1.1 Binding for MTOM 1.0 ([SOAP MTOM 1.0] ). · WS-I Basic Profile Version 1.1 ([WS-I BP 1.1]). · WS-I Basic Security Profile Version 1.1 ([WS-I BSP 1.1]). · OASIS WS-Reliable Messaging 1.1 ([WSRM 1.1]). The use of each of these specifications is described below. The W3C XML Schema 1.0 ([XMLSCHEMA11-1, XMLSCHEMA11-2]) specification defines an application protocol for imposing constraints on the storage layout and logical structure of data objects using text tags or “markup.” Compliance with the requirements of the XML Schema 1.0 specification is REQUIRED for compliance with this service interaction profile. The W3C Namespaces in XML ([XML-NAMES]) specification defines conventions for defining and referring to separate XML tags. Compliance with the requirements of the Namespaces in XML specification is REQUIRED for compliance with this service interaction profile. The W3C SOAP 1.1 ([SOAP 1.1]) specification defines message exchange patterns and message structures for use with XML. Compliance with the requirements of the [SOAP 1.1] specification is REQUIRED for compliance with this service interaction profile. The W3C WSDL ([WSDL 1.1]) specification enables the description of services as sets of endpoints operating on messages. Compliance with the requirements of the [WSDL 1.1] specification is REQUIRED for compliance with this service interaction profile. Further, each MDE implementation MUST be accompanied by an implementation-specific WSDL document that imports the namespace defined in one of the above files and defines a <wsdl:service> element containing a <soap:address> element with a location attribute whose value provides an HTTP URL at which the MDE implementation can be invoked. Example (non-normative) implementation-specific WSDL documents for each MDE are provided with this specification and listed in the table above. The W3C XML Signature Syntax and Processing ([XMLDSIG-CORE1]) specification defines representations of signatures of Web resources, portions of protocol messages (anything that may be referenced by a URI), and procedures for computing and verifying such signatures. Compliance with the requirements of the XML Signature Syntax and Processing specification is REQUIRED for compliance with this service interaction profile. The WS-Interoperability Basic Profile 1.1 ([WS-I BP 1.1]) specification defines a set of best practices for implementing interoperable web services. Compliance with the requirements of the [WS-I BP 1.1], with the exceptions noted in Section 1.2.7, is REQUIRED for compliance with this service interaction profile. The SOAP 1.1 Binding for MTOM 1.0 ([SOAP MTOM 1.0]) defines a set of best practices for implementing interoperable serialization of the SOAP envelope and its representation in the message. This binding MUST be used as a replacement for the WS-I Attachments Profile 1.0 and the W3C Simple SOAP Binding Profile in the WS-I Basic Profile [WS-I BP 1.1]. Compliance with the requirements of the [SOAP MTOM 1.0] and the specifications that this binding references, the SOAP Message Transmission Optimization Mechanism (MTOM) ([MTOM]) and the W3C XML-binary Optimized Packaging (XOP) specifications ([XOP10]), is REQUIRED for compliance with the web services service interaction profile. · R3103 - A SIGNATURE MUST be a Detached Signature as defined by the XML Signature specification. The WS-Reliability 1.1 ([WS-RM 1.1]) specification complements [WS-I BP 1.1] and defines a set of extensions for exchanging SOAP messages with guaranteed delivery, no duplicates, and guaranteed message ordering. The key words “MUST”, “MUST NOT”, “REQUIRED”, “SHALL”, “SHALL NOT”, “SHOULD”, “SHOULD NOT”, “RECOMMENDED”, “MAY”, and “OPTIONAL” in this document are to be interpreted as described in [RFC2119] and [RFC8174] when, and only when, they appear in all capitals, as shown here. Information transmitted between MDEs that is of an arbitrary format, and is related to the message(s) in the transmission in a manner defined in the ECF 5.0 specification. An attachment may be in XML format, non-XML text format, encoded binary format, or un-encoded binary format. A message transmission returned by some operations some time after the operation was invoked (asynchronously). An electronic equivalent of a document that would otherwise be filed on paper in a traditional, non-electronic fashion. The process invoked when a court receives a pleading, order or notice, with no errors in transmission or in presentation of required content, and records it as a part of the official record. An attorney, judicial official or a pro se (self-represented) litigant who electronically provides filings (combinations of data and documents) for acceptance and filing by a court, or who has successfully filed filings with a court. An electronic submission (with any associated data, one or many lead and connected documents, and the like) that has been assembled for the purpose of being filed, either into a specified court case, or to initiate a new court case. A logical grouping of operations representing a significant business process supported by ECF 5.0. Each MDE operation receives one or more messages, returning a synchronous response message (a reaction to a message received) and returning an OPTIONAL asynchronous (later) response message to the originating message sender. An MDE in ECF is comparable to a UML “Component”, “Port” or “Class” with the “implementationClass” stereotype. Information transmitted between MDEs that consists of a well-formed XML document that is valid against one of the defined message structure schemas in the ECF 5.0 specification. A message may be related to one or more attachments in a manner defined in the ECF 5.0 specification. A Message in ECF is comparable to a UML “Parameter” or “Class” with the “Type” stereotype. The sending of one or more messages and associated attachments to an MDE. Each transmission must invoke or respond to an operation on the receiving MDE, as defined in the ECF 5.0 specification. A function provided by an MDE upon receipt of one or more messages. The function provided by the operation represents a significant step in the court filing business process. A sender invokes an operation on an MDE by transmitting a request with an operation identifier and a set of messages. An Operation in ECF is comparable to a UML “Operation”. A definition of the input message(s) and synchronous response message associated with an operation. Each message is given a name and a type by the operation. The type is defined by a single one of the message structures defined in the ECF 5.0 specification. In an Electronic Court Filing operation, the MDE that receives the request with the operation invocation performs the operation and sends the response. In an Electronic Court Filing operation, the MDE that sends the request including the operation invocation and receives the response with the results of the operation. A message transmission returned immediately (synchronously) as the result of an operation. Every operation has a synchronous response. Electronic Court Filing Version 5.0. Edited by James Cabral, Gary Graham, and Philip Baughman. Latest version: http://docs.oasis-open.org/legalxml-courtfiling/ecf/v5.0/ecf-v5.0.html. M. Gudgin, N Mendelsohn, M Nottingham, H Ruellan, SOAP Message Transmission Optimization Mechanism, http://www.w3.org/TR/soap12-mtom/, W3C Recommendation, January 2005. Namespaces in XML 1.0 (Third Edition), T. Bray, D. Hollander, A. Layman, R. Tobin, H. Thompson, Editors, W3C Recommendation, December 8, 2009, http://www.w3.org/TR/2009/REC-xml-names-20091208/. Latest version available at http://www.w3.org/TR/xml-names/. Freed, N. and N. Borenstein, "Multipurpose Internet Mail Extensions (MIME) Part One: Format of Internet Message Bodies", RFC 2045, DOI 10.17487/RFC2045, November 1996, <https://www.rfc-editor.org/info/rfc2045>. N. Freed, Multipurpose Internet Mail Extensions (MIME) Part Two: Media Types, http://www.ietf.org/rfc/rfc2046, IETF RFC 2046, November 1996. Bradner, S., "Key words for use in RFCs to Indicate Requirement Levels", BCP 14, RFC 2119, DOI 10.17487/RFC2119, March 1997, <http://www.rfc-editor.org/info/rfc2119>. R. Fielding, et al., Hypertext Transfer Protocol -- HTTP/1.1, http://www.ietf.org/rfc/rfc2616, IETF RFC 2616, June 1999. J. Franks, P. Hallam-Baker, J. Hostetler, S. Lawrence, P. Leach, A. Luotonen, E. Sink, and L. Stewart, HTTP Authentication: Basic and Digest Access Authentication, http://www.ietf.org/rfc/rfc2617, RFC 2617, June 1999. Leach, P., Mealling, M., and R. Salz, "A Universally Unique IDentifier (UUID) URN Namespace", RFC 4122, DOI 10.17487/RFC4122, July 2005, <https://www.rfc-editor.org/info/rfc4122>. Leiba, B., "Ambiguity of Uppercase vs Lowercase in RFC 2119 Key Words", BCP 14, RFC 8174, DOI 10.17487/RFC8174, May 2017, <http://www.rfc-editor.org/info/rfc8174>. W3C XML Schema Definition Language (XSD) 1.1 Part 1: Structures, S. Gao, M. Sperberg-McQueen, H. Thompson, N. Mendelsohn, D. Beech, M. Maloney, Editors, W3C Recommendation, April 5, 2012, http://www.w3.org/TR/2012/REC-xmlschema11-1-20120405/. Latest version available at http://www.w3.org/TR/xmlschema11-1/. W3C XML Schema Definition Language (XSD) 1.1 Part 2: Datatypes, D. Peterson, S. Gao, A. Malhotra, M. Sperberg-McQueen, H. Thompson, Paul V. Biron, Editors, W3C Recommendation, April 5, 2012, http://www.w3.org/TR/2012/REC-xmlschema11-2-20120405/. Latest version available at http://www.w3.org/TR/xmlschema11-2/. D. Box, et. al., Simple Object Access Protocol (SOAP) 1.1, http://www.w3.org/TR/2000/NOTE-SOAP-20000508, W3C Note, May 8, 2000. D. Angelov, C. Ferris, A Karmarkar, C Liu, J Marsh, J Mischkinsky, A Nadalin, U Yalçınalp, SOAP 1.1 Binding for MTOM 1.0, http://www.w3.org/Submission/soap11mtom10/, W3C Member Submission, April 05, 2006. E. Christensen, F Curbera, G Meredith, S. Weerawarana, Web Services Description Language 1.1, http://www.w3.org/TR/wsdl, W3C Note, March 15, 2001. K. Ballinger, D. Ehnebuske, C. Ferris, M. Gudgin, M. Nottingham, C. K. Liu, P. Yendluri, Basic Profile Version 1.1, http://www.ws-i.org/Profiles/BasicProfile-1.1-2004-08-24.html, WS-I Organization, August 2004. M. McIntosh, M. Gudgin, K. Scott Morrison, A. Barbir, Basic Security Profile Version 1.1 (Final Material), http://www.ws-i.org/Profiles/BasicSecurityProfile-1.1.html, WS-I Organization, January 2010. Extensible Markup Language (XML) 1.0 (Fifth Edition), T. Bray, J. Paoli, M. Sperberg-McQueen, E. Maler, F. Yergeau, Editors, W3C Recommendation, November 26, 2008, http://www.w3.org/TR/2008/REC-xml-20081126/. Latest version available at http://www.w3.org/TR/xml/. XML Encryption Syntax and Processing, D. Eastlake, J. Reagle, Editors, W3C Recommendation, December 10, 2002, http://www.w3.org/TR/2002/REC-xmlenc-core-20021210/. Latest version available at http://www.w3.org/TR/xmlenc-core1/. XML Signature Syntax and Processing Version 1.1, D. Eastlake, J. Reagle, D. Solo, F. Hirsch, M. Nyström, T. Roessler, K. Yiu, Editors, W3C Recommendation, April 11, 2013, http://www.w3.org/TR/2013/REC-xmldsig-core1-20130411/. Latest version available at http://www.w3.org/TR/xmldsig-core1/. XML-binary Optimized Packaging, M. Gudgin, N. Mendelsohn, M. Nottingham, H. Ruellan, Editors, W3C Recommendation, January 25, 2005, http://www.w3.org/TR/2005/REC-xop10-20050125/. Latest version available at http://www.w3.org/TR/xop10/. Global Justice Reference Architecture Web Services Service Interaction Profile 1.3, https://it.ojp.gov/GIST/56/Global-Reference-Architecture--GRA--Web-Services-Service-Interaction-Profile-Version-1-3, Global Infrastructure/Standards Working Group, May 1, 2011. This section describes the design of the Web Services Service Interaction Profile and identifies how it satisfies the requirements of a document signature profile listed in Section 5 of the [ECF 5.0] specification. In addition, this profile is intended for compatibility with the Global Reference Architecture Web Services Service Interaction Profile [GRA WS-SIP]. All ECF 5.0 messages sent via this service interaction profile MUST include this URI in the <SendingMDEProfileCode> element. In addition, any court supporting this service interaction profile MUST include this URI in the <SupportedMessageProfile> element in the CourtFilingResponseMessage. Each ECF 5.0 message transmission sent using this service interaction profile MUST be encapsulated in a SOAP message over the HTTP 1.1 protocol as defined in the [WSI-I BP 1.1] and [SOAP MTOM 1.0] specifications. 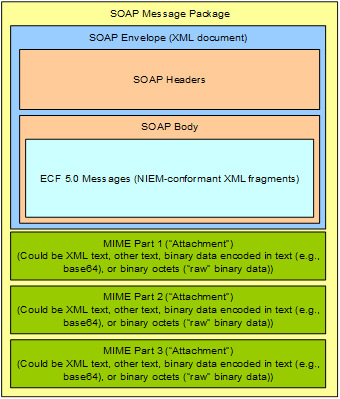 Figure 1 illustrates the containment of ECF 5.0 messages and attachments within a SOAP Message Package. For compliance with this specification, a SOAP envelope MUST contain one or more messages and MAY contain one or more attachments. Each ECF message transmission sent using this service interaction profile MUST identify the sending and receiving MDEs with universally unique address identifiers. The identifier for each MDE will be assigned by the organization that manages the MDE and MUST be the HyperText Transfer Protocol (HTTP) or HTTP over Secure Socket Layer (SSL) permanent URL for the MDE web service. This URL MUST be the value of the location attribute of the <soap:address> element contained within the <wsdl:service> element that binds the MDE’s portType to a service, and that is defined in the implementation-specific WSDL document discussed in section 1.2.4 above. Each message transmission MUST either identify the operation or operations being invoked or be a synchronous response to a previous request. Each operation MUST be either a REQUIRED operation as defined in the ECF 5.0 specification or an OPTIONAL operation identified as supported by the court through the current machine-readable court policy. The response to a request for an operation not supported by the court MUST be reported using the <cbrn:MessageContentError> element in the core message OR a SOAPFault in the SOAP envelope. Each message transmission MUST identify the operation being invoked within the SOAP Body only; the (qualified) operation name MUST be the qualified name of the first child element of the SOAP body element, as called for in section 7.1 of the [SOAP 1.1] specification. An MDE implementation MAY allow message transmissions that include a SOAPAction HTTP header. In compliance with the [WSI-I BP 1.1] specification, a receiving MDE MAY NOT rely on the value of the SOAPAction HTTP header in processing the message. Synchronous responses to requests MUST be encoded using the MIME binding defined in Section 4.1.1 of the [SOAP MTOM 1.0] specification. The receiving MDE MUST deliver the asynchronous response to a request sent using the web services service interaction profile by sending the asynchronous response to the sending MDE via the web services service interaction profile. The response message transmission MUST conform to the rules for message transmissions established in section 2.5 of this specification above. The ECF 5.0 messages MUST be encapsulated in the SOAP Body. All other attachments MUST be included in separate MIME parts as shown in Figure 1. The delimiters between the message and the first attachment, and between attachments, MUST comply with the rules for delimiting MIME parts as defined in [RFC2045]. Each MIME part that includes an attachment MUST have a unique “Content-ID” as defined in [RFC2045] that uniquely identifies the content within that part. The SOAP message MAY include a digital signature applied to the SOA Body and all MIME parts that contain messages or attachments. The digital signature MUST be conformant with Section 8 of the [WS-I BSP 1.1] specification which references the [XMLDSIG-CORE1] specification. The algorithms defined by [XMLDSIG-CORE1] support non-repudiation of the signer and signing date through a digital signature created using the signer’s private key. Because the sender is the only one with access to the private key and the date is included in the signature, receivers can be reasonably assured of the signer and signing date. The algorithms defined by [XMLDSIG-CORE1] support message integrity through inclusion of a public-key-based digital signature. Because the signing date and message hash are included in the signature and the entire signature is computed using the sender’s private key, the receiver can compare the hashes to verify that the message has not been altered since it left the control of the sender on the specified date. If the Filing Review MDE supports the filing of confidential filings and publishes the court’s public key in court policy, messages and attachments MAY be encrypted for filing into the court according to Section 9 of the [WS-I BSP 1.1] specification which references the [XMLENC-CORE1] specification. Because the Filing Review MDE is the only one with access to the court’s private key, filers can be reasonably assured that only the Filing Review MDE will be able to read the message or attachment. This mechanism MAY be used to protect sensitive or confidential information in a filing such as the FilingPaymentMessage However, this specification does NOT support the transmission of messages and attachments encrypted with the court’s public key to other parties in the case. Any messages and attachments transmitted to other parties MUST be either encrypted with the party’s public key or not encrypted. This specification and the [ECF 5.0] specification do NOT define the exchange or publication of public keys by persons or organizations other than the court. Each MDE MAY define HTTP credentials for authentication to access the operations supported by that MDE. If authentication is required, the sending MDE MUST include the credentials in the request as defined in [RFC2617]. For instance, the Filing Review MDE MAY assign user ID and password pairs to each supported Filing Assembly MDE, and require authentication for ReviewFiling operations but not query operations. In that case, each Filing Assembly MDE would include the user ID and password assigned to them in each filing. If a court expresses support for message reliability in human-readable court policy, a sending MDE MAY include reliability extensions to the SOAP envelope as defined in the [WS-RM 1.1] specification. An MDE that receives a request with a SOAP envelope that includes reliability extensions MUST include reliability extensions as defined by [WS-RM 1.1] in the response. [WS-RM 1.1] defines mechanisms by which messages MAY be split into multiple pieces that are assigned sequence numbers and transmitted separately by the RM Source (sending MDE) and reassembled into the complete message by the RM Destination (receiving MDE). An implementation of the web services message profile MUST ensure that the complete SOAP message, including the SOAP envelope, any attachments, and signatures, is available to the receiving MDE for persisting and auditing purposes. Implementation of this service interaction profile MUST be described in a WSDL file that imports a WSDL definition file included with this specification. An implementation conforms with the ECF 5.0 Web Services SIP if the implementation meets the requirements identified by capitalized key words [RFC2119] in Sections 1 and 2 and publishes a WSDL as required in Section 3. Philip Baughman, Tyler Technologies, Inc.
James Cabral, MTG Management Consultants, LLC. Kevin Nelson, Tyler Technologies, Inc.
Enrique Othon, Tyler Technologies, Inc. This non-normative section provides an example WSDL implementation of this service interaction profile. This is also included in FilingReviewMDEService-Example.wsdl file included with this specification. Note that the following is for illustrative purposes only. This non-normative section provides an example transmission that demonstrates an operation invocation, a synchronous response, and an asynchronous response using this service interaction profile. Note that these examples are for illustrative purposes only. This is an example of a request including a ReviewFiling operation invocation. This is an example of a cbrn:MessageStatus synchronous response. This is an example of a NotifyFilingReviewComplete asynchronous response. Updated to latest OASIS template. Updated definitions and WSDLs to align with ECF 5.0 WD37. Removed duplicated WSDL files. Updated SOAP message diagram. Updated definitions and WSDLs to align with ECF 5.0 WD39.